If there were one emblem of Western history, it might be the American buffalo. In Matthew Testa's new documentary, The Buffalo War, that emblem becomes the focal point for an impassioned controversy. "The buffalo provide a mirror," says Testa. "They reflect how we see ourselves and our place in wilderness. And that reflection is incredibly different, depending on who you are." The film centers around Yellowstone's famous bison herd, which includes the last wild stock in the lower 48 states. Each winter, some of the animals migrate beyond the park's snowy boundaries to search for forage. As the bison descend into Montana's neighboring Gallatin National Forest, they carry brucellosis, a bacterial disease that once exacted large tolls on the cattle industry. While no proof exists that buffalo spread brucellosis to cattle, in an effort to control the disease, Montana state officials have killed over 3,000 bison since 1985, prompting fierce debate over their methods and their motives (HCN, 1/29/01: Montana, feds find common ground for bison). 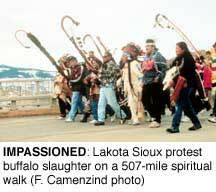 Testa introduces us to protesters like Rosalie Little Thunder, a Lakota Sioux, who leads a 507-mile walk to protest the slaughter, and Mike Mease, founder of the Buffalo Field Campaign, an activist group that uses civil disobedience to block buffalo capture. We also watch the six Munn brothers, who graze their cattle on the Gallatin and struggle to save their ranch. The film contains the heart of Western history and its multiple cultures, and opens a debate that should resonate far beyond the boundaries of Yellowstone. The hour-long film aired on PBS stations in the mountain states in November and should air again early next year. For broadcasting schedules, visit www.pbs.org/buffalowar; to order the film, call Bullfrog Films at 800/543-FROG or e-mail [email protected].